I work at the Capitol in Topeka (not the Hunger Games evil place), so every day I walk the hallways where attorneys, legislators, senators and others members of our local government roam. My momma didn't raise no fool, so every time I pass by someone down a hall and make eye contact, I nod. This is polite and also nice. I think sometimes my nods end up looking like Jim Halpert's from The Office. So imagine me doing that nod and half a smile every single day, perhaps dozens of times. Well, a couple of weeks after working there, Elena, my self and another couple went out to a restaurant to have dinner. As soon as I walked in the door, an older gentleman looked at me, so what did I do? 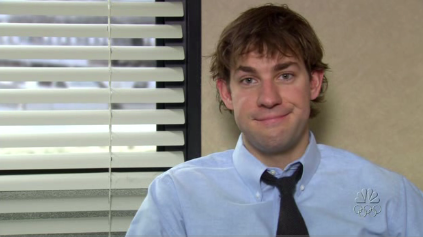 I did the Jim Halpert. My brain was so hardwired to do this nod that I just did it to a random person who was just curious to see who had entered. The guy didn't nod back, but just gave me a puzzled look and then looked somewhere else.